Today, the UNIX time counter will reach 1234567890. To honor this consequence of the number system, celebrations are being held all over the world. 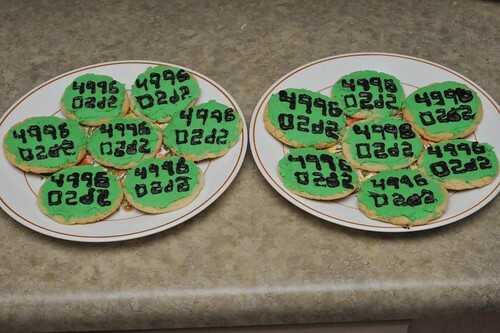 We had some debate at my workplace about the proper sort of ceremony to perform (I suggested setting up a token ring network using old machines), but in the end I decided to bake some cookies. The cookie recipe I followed is from allrecipes.com, and the frosting is from the Better Homes and Gardens 1978 edition (its just 6tbsp butter, 16oz powdered sugar, milk and 1.5tsp vanilla). Note: 12345678990 in decimal = 499602D2 in hexadecimal. 4 Responses to Happy Epoch Day! You’re such a well-rounded geek! You crack me up. And you cook, no less. You’ll make someone a happy wife someday. Great pun with the 4-bytes thing. Was that your idea? Genious! @Joel: yeah, it was my idea! thanks! I just got a wordpress blog, check it out! I gave you a photo credit for my banner.